Thanks to everybody for the interest in my newly released video, Hawaii Volcanoes, which was played more than 35,000 times on Vimeo in the first week. Although information about the scenes depicted is available elsewhere on the blog, I wrote this post to collect it in a single spot for the benefit of viewers. High-res stills from the video may be downloaded for personal use or posted (with link & credit) in write-ups about the video. The rising sun colors the sky above the immense summit caldera of Mauna Loa, an active volcano, as evidenced by the fumaroles on the floor. Few get to see this scene: I did not meet a single person there for the entire day. Hiking Mauna Loa is an arduous 13 mile journey on mostly trail-less lava rocks during which I did not see a single plant. This could be another planet. 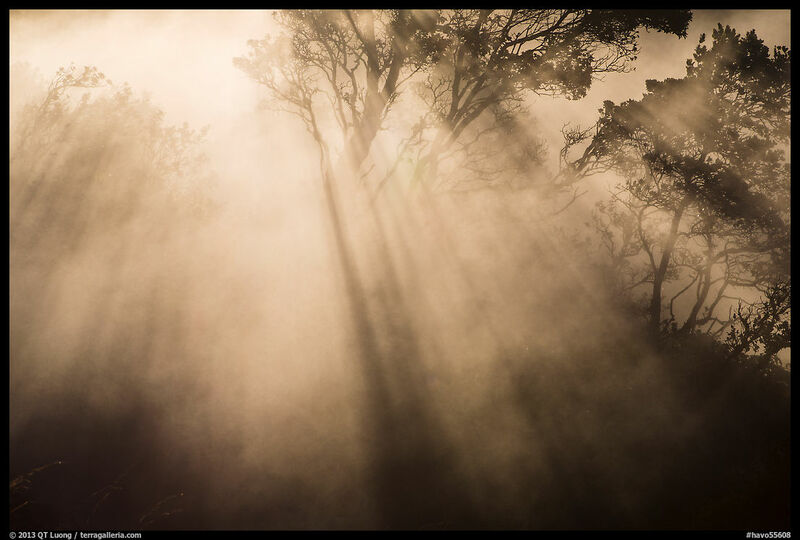 Next to the Kilauea caldera, fumaroles and endemic Ohia trees (see also next image) are backlit by the rising sun. The Hawaiian islands are further away from a major land mass than any other. Plants who managed to make the voyage to the once barren islands evolved into more specialized life forms. Over 80 percent of Hawaii’s native flora and fauna is found nowhere else in the world. Kilauea is the world’s most active volcano, erupting continuously for thirty years. Halemaumau crater – home to Pele, Goddess of Hawaiian Volcanoes according to the traditions of Hawaiian mythology – is a pit crater within Kilauea caldera. 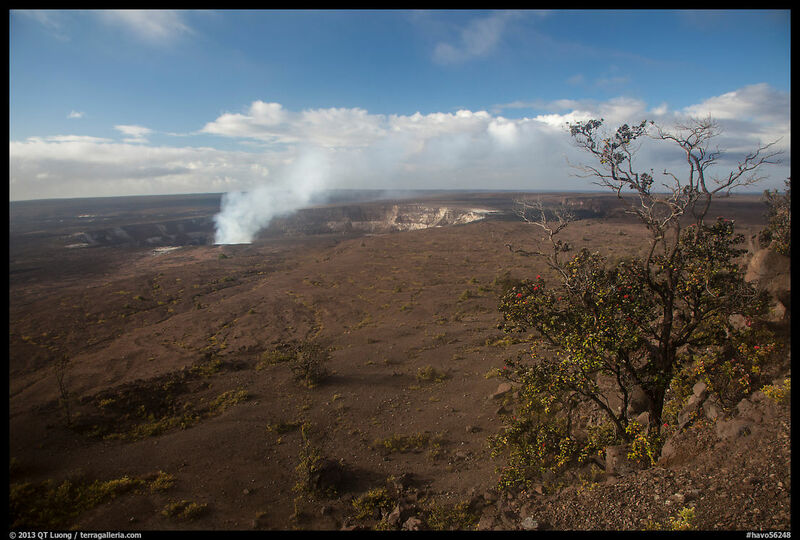 During my two first visits there, a decade ago, I could walk to the edge of the crater, which is no longer possible because in 2008, a series of explosive eruptions awakened the Halemaumau crater, which now spews a dangerous sulfur dioxide plume day and night. Lava flows several miles from the center of the eruption, and eventually meets the ocean, forming a acid gas plume when it contacts water. Unlike most, the lava from Hawaii volcanoes is very fluid, creating the rope-like patterns. As there is little danger of explosion, I could approach the 2000 Fahrenheit degrees lava to a few feet, until the heat became unbearable. One of the most mesmerizing spectacles of nature you will witness is glowing lava cascading into the ocean to form new land in front of your eyes, which is instantly destroyed by the action of the ocean. I had to be careful not to stand on unstable lava cliffs, since they are known to collapse into the ocean without warning. 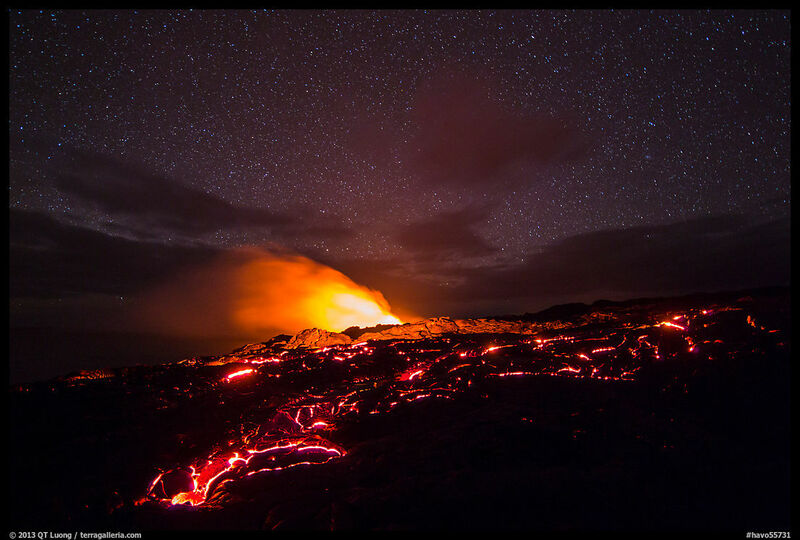 More about photographing the lava ocean entry in Hawaii. 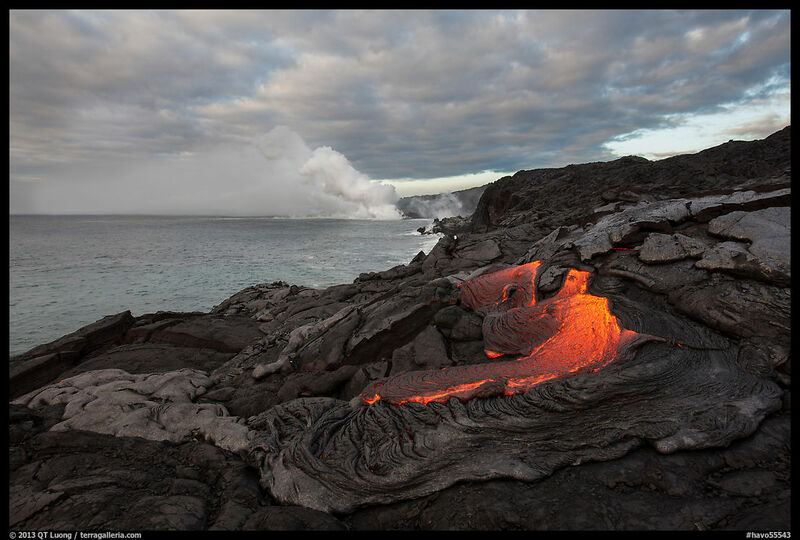 Most of the time, lava flows underneath the surface. The first time I returned at night, its glow through cracks startled me, since by day I had stepped onto the freshly hardened lava, unsuspecting that molten lava was flowing underfoot. 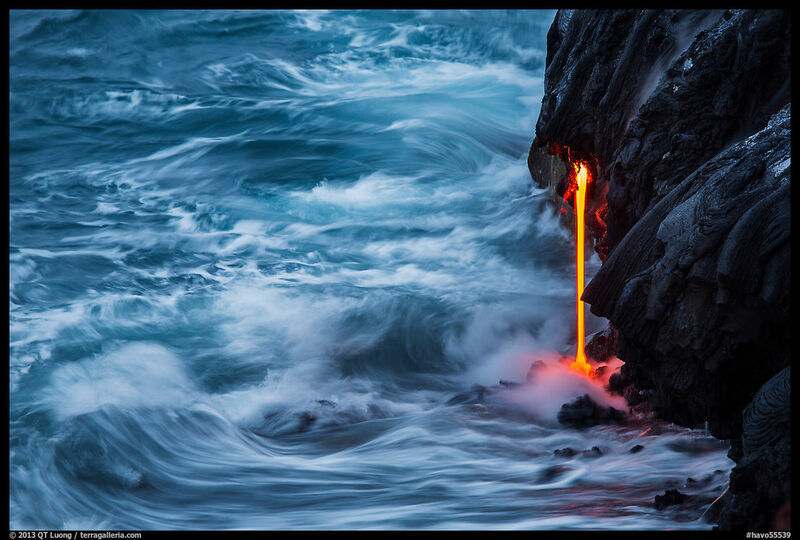 In the background, lava cascading into the ocean illuminates the plume and land. After everybody had left, I stayed to record the pulse of the flow over an entire night. At night, molten lava, forming a lake at shallow depth within the Halemaumau vent, create a spectacular incandescent illumination. The juxtaposition with the Milky Way shows creation through violent gases from two time eras, the distant past of the stars, and the present on earth. I captured it appearing in a weather break above by setting up my camera in driving rain, protecting it with an improvised cover so I could leave it all night. 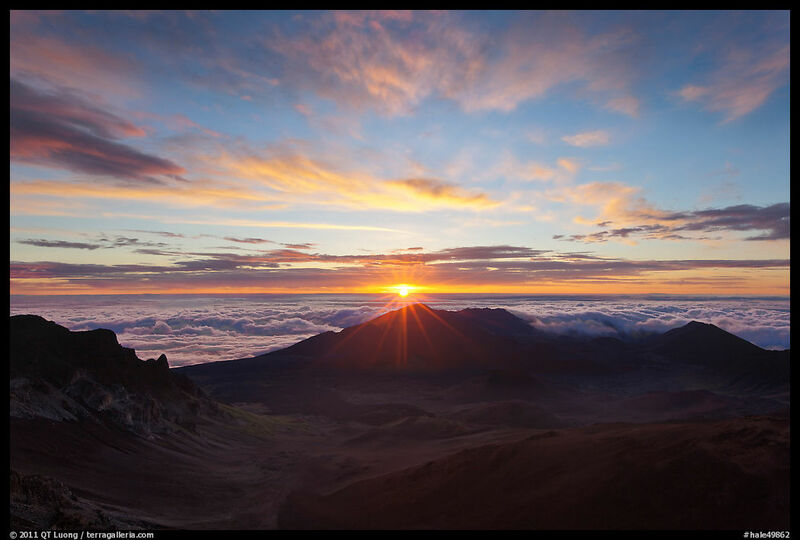 At 10,500 feet, Haleakala is one of the world’s largest dormant volcanoes. As a tall peak on an island, its summit is often floating above clouds, on top of the inversion layer separating lower maritime air from upper atmospheric air. 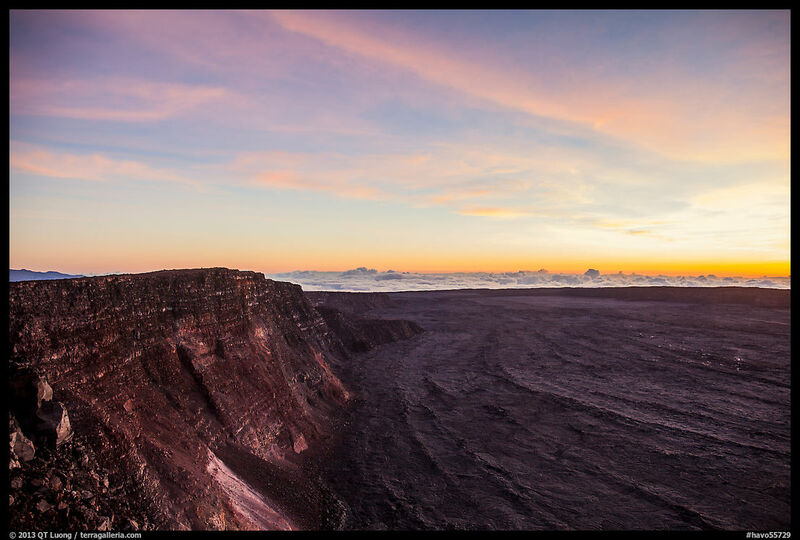 The sunrise from the top of the crater is considered by many to be the “most beautiful sunrise in the world”, prompting many to leave their resorts at 2am to witness it. In an opening in clouds, the distinctive shield volcano shape of Mauna Loa on the Big Island is seen one island away from Haleakala on Maui. 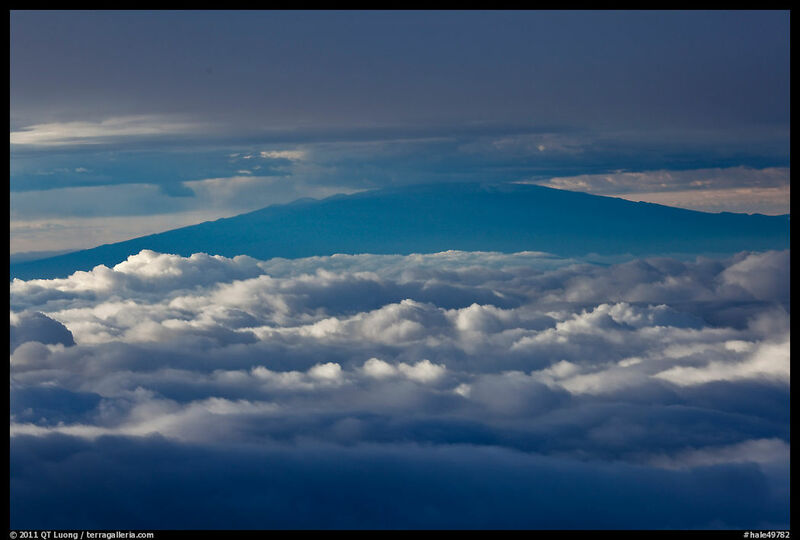 Mauna Loa’s very gently slopping 10000 cubic miles makes it the world’s most massive mountain. The world’s largest volcano, it rises just 13700 feet above sea level, but its 42000 feet below the sea make it the tallest mountain from base to summit. 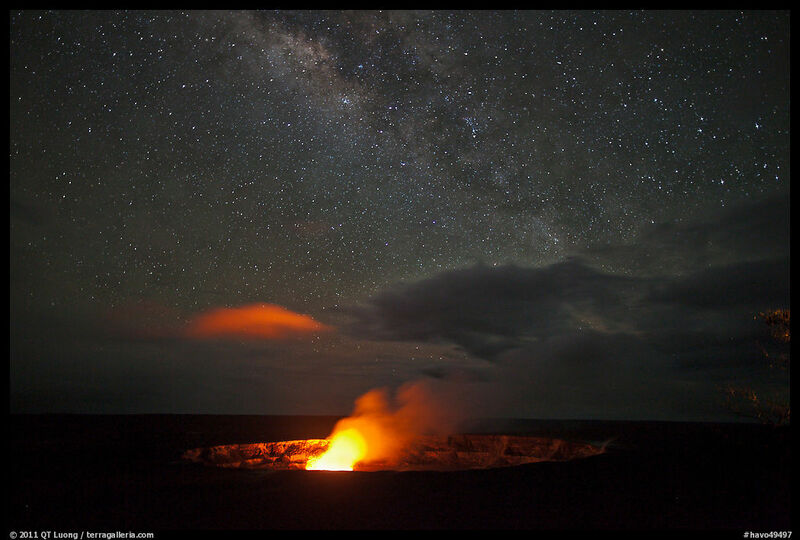 Check out my extensive collection of images of Hawaii Volcanoes National Park. Amazing images not seen anywhere else in the world. Thank you. Thanks Monroe. Indeed truly a unique place. Beautiful! As I’m starting out on time-lapse photography I was enthralled by this. Thanks for sharing! Thanks David, and good luck in your endeavors. Exquisite work. Love the cloud footage. Thanks Amy for a counterpoint to all those who love the lava. For me the point was the unity of everything. Greetings! Thank you for sharing the incredible images of this amazing and dynamic planet that we all call home. Thank you for sharing this beautiful work ! Thanks Rick. It’s been my goal all along to inspire. Fascinante. A sua coragem nos deu um belo presente. as imagens são maravilhosas. Thanks, that’s a great compliment from someone who had access to such active locations. This video just moved Hawaii volcanoes to the top of my bucket list! Hi , this was an amazing experience. Thanks for sharing them movie and pics with USC. Amazing shots of an amazing place by an amazing photographer. Thank you. Excellent photo art and information. Makes me want to go back. I walked out on those lava fields to the ocean edge 20 years ago. I found the experience so moving that I felt I should avert my eyes watching the “birthing” of new life forms on the surface of Planet Earth. Thanks you for this gorgeous recreation of the true feeling of that experience…. It is amazing footage, with wonderful and appropriate music to match. I would love to see these volcanoes for real – you have got some amazing shots and it ha all been put together brilliantly. Well done! Wow, great pics and footage! Question though: The rotation of the earth always makes my shots of stars blurry. What’s the secret in these pictures? High aperture lens, rotating tripod, extremely clear skies, post-production? The rotation of the earth should make stars into sharp star trails, rather than making them blurry. If they appear blurry, then it is a different problem, usually camera shake or poor focus. If the sky isn’t clear, this would result in dimmer stars rather than blurry stars. No post-processing that I know can transform blurry stars into sharp stars. If the question is how to photograph point stars rather than star trails, the key is to use an exposure short enough. A good starting point is to divide the 500 by the focal length you are using (assuming full-frame). This gives you the maximum exposure in seconds. For instance, with 24mm lens, you need 500/24 = 20s or shorter. That’s where a fast lens comes handy. At 20s, f1.4, the correct exposure for the Milky way is 1600-3200 ISO. With a slower lens, you’d have to use higher, more noisy ISOs. A tracking mount would allow you to use a longer exposure without star trailing, but then the landscape features would be blurred, necessitating blending with another frame. Amazing work! Can I ask what f stop, iso and shutter speed you used for the night timelase with the stars? Keep up the amazing work! The first one (with the volcano) was shot at 15.0 sec, f/1.4, ISO 1600. 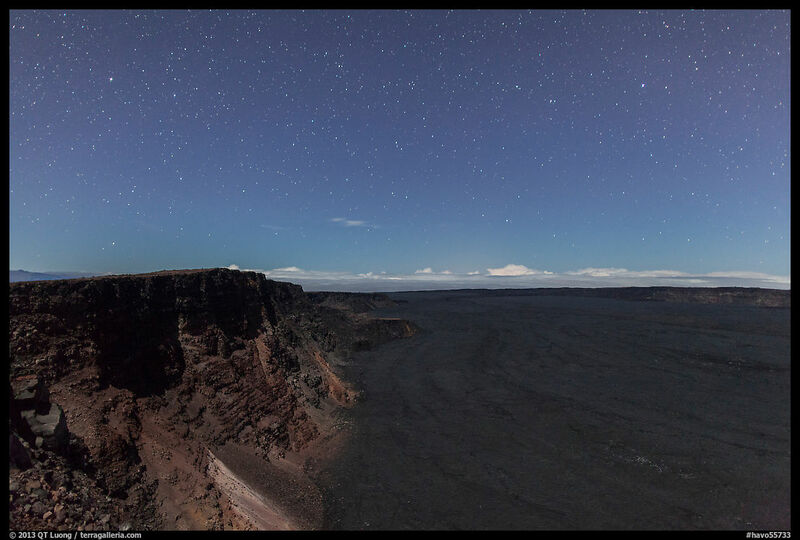 The second (closing sequence on Mauna Loa): 20.0 sec, f/2.0, ISO 2500. Both with 24mm f/1.4 lens.